comes to. He will not believe a fool.”- King Lear 1. 4. 660. A 15th-century jester. Image: (c) The Broadside Parishes. What we have here is a certificate that Folebarba (Funnybeard) the jester might have carried on his person when he was parted from his master. It is also imaginable that the earl of Hereford wanted to ensure Folebarba’s comfort and safety at their mutual place of destination where the jester was simply arriving before the earl. Whatever the context, this delightful note reveals how a slip of parchment could act as a device authenticating or vouching for the good character of its bearer. In fact, it was common for vagrants and travelers to tote around “testimonies of trustworthiness” in the case their integrity came under scrutiny. In 1248, five men visiting Essex and acquitted of horse theft in the local courts were forbidden to return to the county unless they brought back with them “their testimonial of trustworthiness (warrantum suum de fidelitate).” In 1261, an apprehended horse thief, Robert de Parys of Battle, was released by the authorities on the condition he would fetch a testimonial of trustworthiness to present before the courts … but Robert never returned. Apparently he wasn’t very trustworthy. It is possible that the earl of Hereford’s genteel friends had reason to distrust a jester lacking such a certificate. Given the way jesters were generally recruited, the court goofball could come from a variety of social backgrounds and therefore be eyed with suspicion. In her book on the history of the jester, Beatrice K. Otto explains that “an erudite but nonconformist university dropout, a monk thrown out of a priory for nun frolics, a jongleur with exceptional verbal or physical dexterity, or the apprentice of a village blacksmith whose fooling amused a passing nobleman” could emerge from their humble beginnings and become witty companions to the rich. Perhaps the earl of Hereford feared that his companions would mistreat a jester separated from the protection of his master, on the grounds of his low birth. M. T. Clanchy notes also that jesters were wont to make enemies when their jokes caused offense or ribaldry got out of hand. The earl’s concern for the welfare of Folebarba is touching nonetheless, and this document shows that medieval people considered pieces of parchment a legitimate means of certifying that persons under question or suspicion were indeed trustworthy. 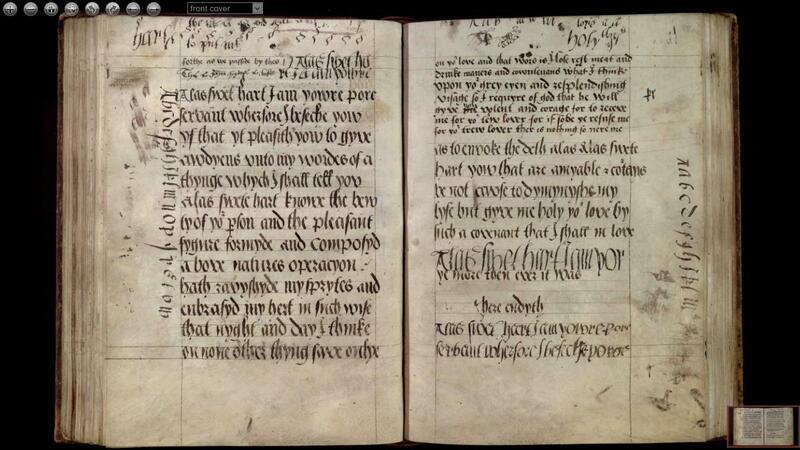 Transcription of the original Middle English from Trinity College Cambridge MS R. 4. 20, fols. 87v-88r. Cambridge, Trinity College MS R.4.20, fols. 87v-88r. Image: Trinity College, Cambridge. This letter serves as a good example of how imperative material context can be when examining a piece of historical writing. 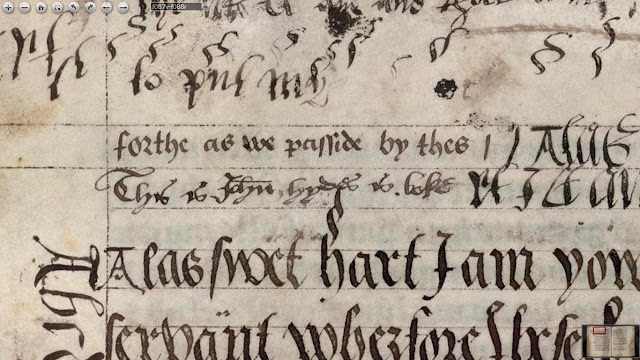 By looking solely at the transcription I have provided above, you might reasonably assume this is a late-medieval love letter written in Middle English. Perhaps you are even swooning and wishing your own beau would write you something so full of passion! Perhaps you are hoping (like myself) that the word “resplendishing” will be re-introduced into the modern English vocabulary. It is certainly a provocative and entertaining fragment of writing. First impressions quickly fade away, however, when we look at the location of the letter in this codex and what is going on in the margins. The love letter is found in Cambridge, Trinity College MS R. 4. 20, which begins with The Travels of Sir John Mandeville (fols. 1r-87r), contains one of the extant versions of John Lydgate’s poem, The Siege of Thebes (fols. 89r-169r), includes fragments of several hymns (fols. 169v-172r), and a few lines of Chaucer’s Troilus and Criseyde (fol. 171v). The letter is located in the middle of the book, on two of three blank pages that separate Mandeville’s and Lydgate’s works. Miscellanies such as this one are particular to late medieval England, the Auchinleck manuscript being perhaps the most well-known example of them. Containing a variety of both religious and secular material, they acted as a kind of miniature library for the middle-class household which might have only otherwise been able to afford a book of medicinal recipes. 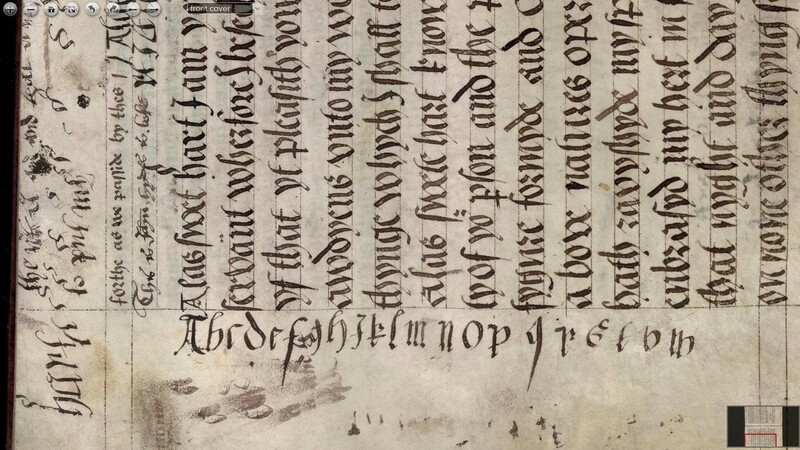 Books and parchment were expensive items due to cost of production and this may explain why the scribe, who might be an owner, John Hyde (as he pens himself at the top of the first page), chose to make use of the blank space in the middle of his book. All the evidence quite literally “about” this letter seems to suggest that John Hyde (?) was conducting a writing exercise or perhaps practicing his letter before setting it down in ink on the expensive piece of vellum he intended to send to his lover. The margins of the letter are riddled with pen-trial marks and even a few alphabets written lengthwise down the page. Cambridge, Trinity College MS R.4.20, fol. 87v (detail). Marginal alphabet. 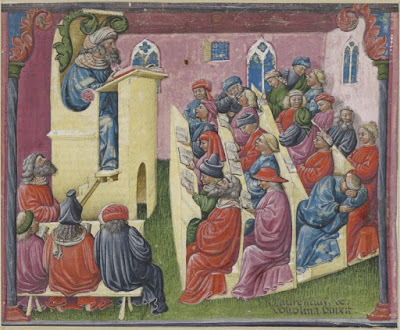 University lecture, from a 14th-century MS. Miniature by Laurentius de Voltolina. Image: (cc) Jörg P. Anders, Kupferstichkabinett der Staatlichen Museen zu Berlin. Some things never change. Judging by the number of extant letters that involve a son writing to his father and/or mother for more money, university students seem to be able trace their stereotypical poverty right back to the medieval period. As a father in an Italian formulary letter sighed, ‘‘a student’s ﬁrst song is a demand for money, and there will never be a letter which does not ask for cash.’’ It appears that the author of this letter wrote to his father hoping he would refill his son’s empty coffers. When the father wrote back professing his “tender paternal affection” without anything tangible to show for it, he worked his son into a bit of a rage. The son argues that his father is worse than a savage beast, defying the laws of both nature and justice since even the most ferocious of creatures, lions and tigers, provide for their young until they reach a stage of independence. The severity with which the student addresses his father is surprising (and hilarious) since such letters functioned largely as rhetorical exercises. Although the metaphor drawn from the natural world gives the letter a hint of sophistication, the son’s contention that he has been gravely mistreated shines through in a very … colourful way, particularly in his exclamation of “saneque” which translates more literally to “for sanity’s sake!” The letter’s rough Latin, moreover, suggests that this student relied in no way on a model letter as many other medieval students did, but composed the thing himself. Whether or not he worked up the courage to actually send it to his “Pious Paternity” is another matter. The poor fellow may have just needed to vent as university students are wont to do. Letter #3 is from M. T. Clanchy, From Memory to Written Record: England 1066-1307, 3rd ed. (Cambridge: Cambridge University Press, 2013), 91. Letter #4 is from the collection of Western Manuscripts held at the Trinity College Library in Cambridge, digitised. Letter #5 is from Martha Carlin and David Crouch, Lost Letters of Medieval Life: English Society, 1200-1250 (Philadelphia: University of Pennsylvania Press, 2013).